The NordicTrack A.C.T Commercial is a center drive elliptical trainer that has become extremely popular with consumers. In response, NordicTrack released this upgraded version – A.C.T. Commercial 10. The A.C.T. Commercial 10 has a 25 lb flywheel, 24 digital resistance levels, and a 18-22″ adjustable stride. Best of all, it has a 10″ Smart HD Touchscreen that provides motivation during your workout. A note on ACT Commercial Models: You may have noticed the ACT Commercial PRO and ACT PRO Elliptical were both listed on the NordicTrack site. Both of these models have been discontinued and their popular features combined into the ACT Commercial 10. Basically, the ACT Commercial 10 is giving you all of their best elements in one tidy package! 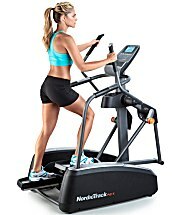 18″-22″ Adjustable Stride —It can be a challenge to find an elliptical with the correct stride length to match your height. Taller individuals can feel cramped on a machine that has a shorter stride. With this adjustable stride, you won’t run into that problem. Adjusting stride length can also help you focus your exercise on different parts of your lower body to get a more “full body” workout. MID-WEEK SALE ENDS THURSDAY: The NordicTrack A.C.T. Commercial 10 is no longer for sale from NordicTrack. We recommend you check out the FreeStride Trainer FS7i instead. Compact Design — The A.C.T. ellipticals have a great compact design where all of the mechanics are condensed into only 54″. (In comparison, the Sole E95 is 82″ in length.) This makes it the ideal type of elliptical for apartment and condo dwellers. Very Stable —Center drive ellipticals have a square base that contributes to a solid, stable feel. It is much better than most ellipticals that tend to rock during a strenuous workout. First, you are centered over the motion so you don’t need to lean forward when using the handlebars. This allows for a more natural position and striding motion. Second, we feel that this type of machine provides a better upper body workout. With front drive elliptical, you often need to consciously plan to put effort on the handlebars. Otherwise, your arms just go along with the motion. With a center drive machine, the resistance is more evenly distributed between your arms and legs. 10″ Smart HD Touchscreen — View your workout stats, training program options and your favorite websites while you workout. This beautifully large screen helps provide motivation while you exercise. iFit Ready — This innovative technology helps you get more out of your workout. You can perform a new workout every day, track your progress, take on HD video workouts, and even replicate real routes with Google Maps. The machine will match the real-life terrain by adjusting incline and resistance as you go. This program does require a paid subscription to access. Note: At the time of this posting, this machine comes with a FREE 1-year iFit Membership. A great value! 35 Installed Workout Programs —This is a nice variety of pre-installed workout programs. Pedal Distance — The pedal distance on the center design of the NordicTrack A.C.T. Commercial 10 is closer than on many models. This is especially beneficial for women of average or below-average height. Warranty — The warranty is lifetime frame, 5-year parts and 2-year labor. A typically strong warranty for NordicTrack machines. The A.C.T. Commercial 10 elliptical is most appealing because of its center drive construction. There are a number of benefits associated with this design, but the small footprint is the best part. It is perfect for those who live in smaller homes like apartments and condos. 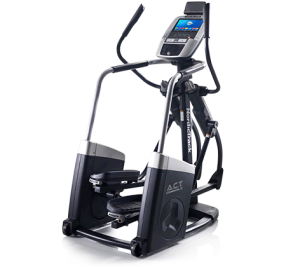 iFit Live and the adjustable stride length are other great and appealing features on this machine. When the price is right, this is an attractive option for buyers. If you want to save abut $500, you might also want to check out the the original NordicTrack ACT Commercial. You will be downgrading o a 5″ backlit screen and a lower warranty, however you still still have the same great design and iFit Live features. You’ll just need to use the tablet holder to view your iFit stats rather than using the on-console display. 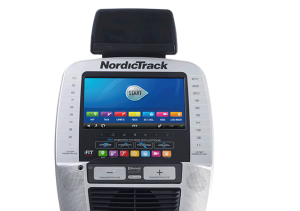 Check out more machines from NordicTrack on our comparison chart here. Front to rear, how much space do you actually need for this machine, when you factor in the back-and-forth motion of the “arms” of the machine as you use it? I have an email in to my inside contact at NordicTrack and will let you know as soon as I hear back from him. He is going to measure and let me know. To front and rear, how much space do you need for this machine? I am also 6″5′ 300 pounds would this be a good machine for me also?